Dale Dauten had a post the other day on the Career Realism Blog that caught my eye. Dale is a well-known author and blogger on networking. In his blog post, he “turned” a couple of phrases that really caused me to start thinking about why networking fails for most people – particularly candidates in a job search. He suggests to “Stop Being Beige”. Dale offers metaphor of don’t wear beige and lean up against a beige wall. STOP being invisible in your job search, in your career in the office, and taken to an extreme — in life. This conjures up images of fading into the woodwork of your network, being invisible in groups as a lurker, and hiding behind your mother’s skirt when you were 3. You don’t have to be the life of the party or the center of attention – but you do have to engage with others. Great things come from engagement with other people. If you’re uncomfortable in group gatherings (an important element of networking is getting out meeting others in groups), take some courses to overcome your fears and discomfort. Practice with your friends. Risk a little – go a networking event (conquer your fears Geronimo – If you haven’t read the children’s book series on the mouse that conquers his fears I would encourage reading them – if the mouse can do it – so can you! Social Media Sites and On-line Social Networking is great – but no substitute for classic face-to-face “pressing the flesh” and physically meeting other people. Dale Carnegie offers courses. There are hundreds of on-line resources about conquering your fear of engaging with others – blogs-webinars-articles-coaching. Toastmasters is one of the best places to build confidence speaking in front of groups – one of the best things I ever did in my 20’s was to participate in a Toastmaster’s Chapter for a couple of years. My daughter plays on a high school varsity basketball team. Up until the last year she had pretty much mastered the art of being beige. Now she can’t be beige. She craves the play time on the varsity team. She’s learning at a very early stage in life that if there’s something you really want – you can’t afford to be beige – or you’ll ride the bench and observe from the sidelines – that’s no fun. Read a new book once a week. Job Search, Networking, Personal Branding, Self-Help – the list is endless. Are you learning how to avoid being beige. What’s the last great book on job search or networking or personal branding you’ve read? Have you read our book, This is NOT the Position I Accepted, which has an entire chapter devoted to job search networking. We offer as a service a Strategic Networking Plan for Executive Level Candidates – have you asked for an initial assessment to determine if you’re a victim of being beige? Brad and I moderate an Internet Talk Radio Show and cover a wide range of job search frustrations, mistakes, and best practices. Have you entered our virtual library of archived radio shows and listened to the programs on networking. What are you doing right now to change and transform yourself from being beige? Who’s Afraid of Job Search Personal Branding? Why is it that so many people don’t get started creating their personal brand? Is it lack of time, fear of failure, not knowing what to do? So – we cycle back to the original question – Why is it that so many people don’t get started creating their personal brand? Brad and I cover personal branding for your job search frequently in our Internet Radio Talk Show. Check out some of the previous broadcasts from our Radio Talk Show Library. What are known for? What subjects and search terms would employers use to find you on the web? If employers typed a particular search phrase into Google, would you appear as one of the top 10 listings? Trends are beginning to show that companies are using job boards less and search tools/social media sites to find candidates. Are you still conducting a job search like it’s 1999 or are you conducting a job search leveraging all the tools now available in 2009? Tell us why you haven’t started your strategy of personal branding yet – here’s some tactics top talent candidates use in personal branding – are you doing any of these? Years ago I worked with a candidate named Wes. He was a living, breathing example of what all candidates should be like. Back then I was a contingent recruiter, meaning I only got paid my fee when a company hired the candidate, Wes was the candidate all contingent recruiters look for. As we say in the industry, “When he goes out for an interview just give him the invoice to hand to the company.” or in other words, Wes was a walking placement. But Why. What made Wes so different from the thousands of other candidates we met and have met, that even 15 years later our firm still remembers him and often refers to him. Wes not only knew what it took to get a job, he lived it. Wes took preparation, practice and presentation seriously. It wasn’t enough that he knew all this, he incorporated into every aspect of his job search. When a company met Wes, he was polished, practiced the introduction, had questions to ask that other candidates hadn’t even thought about, practiced answers to the most commonly asked questions, mirrored the interviewer, prepared how to use his voice and body language to show passion, knew exactly when to pause in his answer to make his point, engaged the hiring manager with meaningful issues during the interview, practiced how to read body language so he knew when to stop talking and re-engage, finally Wes knew when it was time to ask a question or wait until the next interview. Nothing was left to chance. But most importantly, like all well honed professionals, it all came across naturally and appeared effortless. Not staged or rehearsed. Yet, of course it was. Wes decided to do what he had to do to hire himself and he had very high standards for the people he hired. He started reading books, hired coaches, video taped himself, lost weight, shaved his beard, wrote out answers to questions and then rehearsed exactly how to present the answer, rehearsed hand motions, body language, practiced pausing, joined Toastmasters, ensured his resume targeted the position, his resume was about the job – not him, he practiced mirroring, he spent as much time practicing as he would for a board presentation. Nothing was left to chance. WOW that is a lot of work. Recruiters will always be looking for Wes A. You can be one with just some serious preparation, practice and presentation time. Does the Hiring Manager Believe You? Although we might not like to admit it, most hiring decisions occur through likability, rapport, and personal chemistry. Not only do you have to prove that you’ve got “the right stuff”, you’ve got to market it/sell it with enough enthusiasm and excitement that the hiring manager really believes it. How do you overcome this natural tendency to focus on first impressions in the hiring process? One major technique is to do a better job in preparing to interview – this reduces and eliminates the employer bias toward style, personality, and presentation. We identify this preparation as one of the five key elements of a successful job search. You can also learn more about limiting the effect of first impressions and reducing the influence of personality and presentation by following out Internet Radio Show where every week we explore a different element of conducting an effective job search. The past programs can be downloaded from our radio show library. Are You a Believable Candidate? You need to tell them you’re excited about the job because you want to do this kind of work and work for a company like this. You need to tell them you’re going to be fantastic in this job because your experience gives you this list of skills. You need to say this because if you don’t, it’s fundamentally implying that it’s not true. So you say it. Except … if you say that you want this job because you want to work at this company but you really want the job so you have a job, they can tell. If you say you’d be absolutely fantastic in this job because of your whatever but you really mean that you’ll show up and do a good job for awhile and then possibly start slacking off, they can tell. If you don’t believe it, then they won’t believe it either. The solution is to only apply for jobs for which these statements are already true. Just because you fulfill some or all of the requirements for a job does not mean it’s the right job for you. Just because you want to work somewhere does not mean it’s the right job for you. It’s the right job for you if you fulfill the requirements, if you want to work there and if you think you’ll be successul there. Yes, that does narrow down the jobs you apply to, but it also saves you time and means you’ll end up in a job you actually want. A preemptive strike is a good strategy. I came home from work one day and I had just walked in the house as my son came up to me and said, “We need to talk.” He was too young for the birds and the bees and probably knows them anyway, so I knew something was up. He explained that while practicing his pitching for baseball, he threw a wide pitch and broke the window above the garage. I replied, “No big deal, all boys break a window once in a while.” He then said, “Well, that is not all. After that I moved to the other side of the garage and threw another wide pitch and broke the other window, too.” He was scared I would really be mad. However, I thought, “How can I be mad? You stole all my thunder by coming to me. I didn’t have time to get mad.” He did a preemptive strike. How does this relate to a search? I was conducting a search for a Sr. VP Human Resources. One candidate’s resume indicated a lot of turnover. As I went through her background it became clear that there were great reasons for the turnover and in most cases the company turned over on her, not the other way around. The problem was that she wasn’t addressing these in the interview right up front. Basically, she wasn’t defusing a negative situation. We helped change that by putting together a script that dealt with the turnover right up front. In the interview, she preempted the interviewer by saying, “I realize from my resume it appears that I have a lot of turnover, and I can understand why one would think that. Let me explain the circumstances surrounding the turnover as I’m sure it will help clarify this issue.” This defused the situation and opened the opportunity to explain that a lot of the job changes were not her leaving the company, but rather the company leaving her, by either relocating or closing facilities. By addressing it right up front, the candidate demonstrated she had nothing to hide and allowed for a discussion around the issue. When the candidate did get a job, she wrote to us saying she felt this technique played a major role in helping her get past the first interview. Too often a candidate leaves the interview thinking everything is great because the interviewer never mentioned anything about the negative. They don’t understand, that is, because they have no concern about it. You are out, so it didn’t need to be addressed. Don’t avoid negatives. Do a preemptive strike by bringing them up first. Just in case you are wondering, he has broken the same windows again. I started buying replacement windows in bulk. Engaging A Career Coach – Should I?? A career coach is something many people consider engaging. Marcia Bench, Director of the Career Coach Institute discusses everything you should know before considering engaging a career coach. What questions to ask, should you even get a coach, how they work and how they will benefit you, what should you pay and what qualifications they should have. Before paying for a coach, you must hear what Marcia advises. The CFO felt this person showed such poor judgment that he wouldn’t hire him regardless of his qualifications. The interview begins as soon as you enter the parking lot. Please leave your comments or something that has happened to you. Also, click a link below to share this with others. The difference between how you answer a question on phone interview versus a face-to-face interview? A phone interviewing answer should never be longer than __ _____. We have asked these questions to over 1000 candidates at networking meetings, interviews, and association talks. To date not even one person has been able to list all three in the first question. The groups will shout out answers and generally get two of them, but rarely does one person get even two. Why is this important? Who cares? Every candidate looking should care!! If you don’t get past the phone interview then you will never get a job. Many, if not most, companies today are conducting phone interviews first to screen out candidates. Too many candidates undervalue the importance of the phone interview. Ask any recruiter that has done hundreds of these or an HR person that also has done hundreds of these and they will tell you the importance. So, if you didn’t know the answers and want them, you can download this for free. CLICK HERE to go to our FREE resources page. You can see what other resources IMPACT Hiring Solutions offers to help candidates spend less time in search by CLICKING HERE. Question 2: Yes, since body language is 50 – 60% of communications and that is missing in a phone interview, the interviewee is under an additional burden to communicate succinctly and with extreme clarity. Are You The Tiger Woods of Job Hunting? After more than 25 years as a recruiter, I calculated that I have had more than 10,000 interviews in my career. That is a combination of phone and in-person. Of those, at best 5% were exceptional and I knew as we say in the recruiting industry, “This person is a walking placement.” But WHY? So why are you on the market for so long if you know all this stuff? I took a step back and I think I know why. It is because – it is a big leap from knowing something and doing it, and it is a quantum leap from doing it at a highly skilled level. We were aware that most people knew this when we wrote the book. We also know that after 10,000 interviews 5% actually do it and maybe 2% do it with a high degree of skill. In this highly competitive market the bar has been raised so high that only candidates that perform with a very high degree of skill will win the interview and ultimately the job. Anyone who plays golf (or any activity) knows it is a big leap from knowing it and doing it. And in my example, it is a quantum leap to Tiger Woods or for that matter to the PGA Tour. You can’t just “know it” in today’s job market. You have to do it with a high degree of skill. Final thought. Even Tiger Woods to this day has a swing coach. I’m willing to bet most candidates have never even had job hunting lessons. We offer a lot of free resources to help you perform at a high level. CLICK HERE to go to our FREE RESOURCES page. Is it time to clean up your on-line image or personal brand? Does your on-line image convey exactly the type of person a potential employer would want to hire? Do your communications – blog commenting, tweets, linkedin updates, flickr comments, facebook postings on your wall or your friend’s walls – convey the communication, writing, spelling, grammar, language a potential employer might evaluate. Could you get away with the public email address, nickname, avatar, photo streams if you were employed by your ideal employer vs. what you’re doing now on the social media sites. From an employer perspective – your image or “personal brand” is a conglomeration of all these on-line/public activities. We’ve discussed in a number of our Internet Radio Talk show the issue of personal branding in your job search. Feel free to listen or download the audio from our past shows by clicking here. Social media has taken what a few years ago was very private between friends and made it transparent for the world to see. First impressions play an important role in helping hiring managers decide whether to call or meet you. We’ve got an active discussion group on LinkedIn discussing this and many other topics related to your job search. Join us on the LinkedIn Discussion Group by clicking here. Would your Mother be ashamed or proud of you? How about your next boss? The HR department at your next company? What would your co-workers think? What would your most respected friends offer you as advice about your current on-line image or personal brand? Would they be comfortable telling you to clean it up. 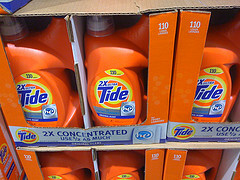 Is it time to apply a little detergent to your on-line image, activities, and personal brand? It might make the difference between taking months off your job search, add thousands to your annual compensation, and lead to a job that provides a lot of personal satisfaction vs. drudgery.